This is our newest class that keeps feet movin’, tappin’ and chasse-ing! Chair Line Dance is a fun time for all- once described as a “party from a chair.” Great classic country tunes from back in the day, mixed with upbeat oldies, keep everyone’s brain active and body moving as the instructor leads the group through energetic steps, stretches and simple choreographic line dances adapted to be done from the chair. 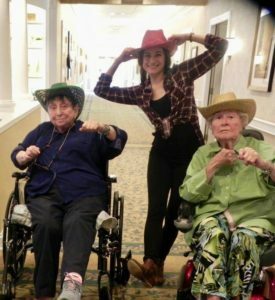 The class is meant for a variety of levels, from extended care centers, assisted living and independent living. 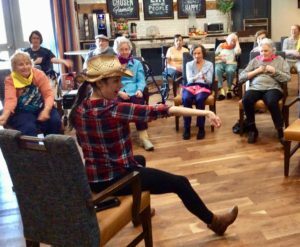 Keep the brain and body active in this hoedown of a good time.